Wonder Gadot, who has been holding her own against the best of her set south of the border, returns to friendlier confines on Saturday for the $500,000 Woodbine Oaks Presented By Budweiser. The Woodbine Oaks, a 1 1/8 mile race for Canadian-bred 3-year-old fillies, attracted a field of five and will go as the 11th of 12 races on a program which also includes the $125,000 Plate Trial and $100,000 Alywow Stakes. Wonder Gadot, Canada's champion two-year-old filly, is owned by Gary Barber and trained by Mark Casse. “She's super; she's doing really well,” said Casse. “We kind of all along felt like Tapeta was her preferred surface. Wonder Gadot made her lone start on the local main track in last fall's Grade 3 Mazarine, recording a six-length victory at 1 1/16 miles. The Medaglia d'Oro filly, bred in Ontario by David Anderson, had raced on turf in her first two outings, winning the prep for the Grade 1 Natalma Stakes and then finishing a close third in the Natalma itself. Following the Mazarine, a trip to Del Mar yielded a troubled sixth-place finish in the 1 1/16 mile Breeders' Cup Juvenile Fillies. The move paid off as Wonder Gadot resurfaced at Aqueduct four weeks after the Breeders' Cup and was a convincing winner of the Grade 2 Demoiselle at 1 1/8 miles. And Wonder Gadot has soldiered on this year with solid in-the-money finishes in each of her five appearances, all in stakes, capped by a close second behind divisional leader Monomoy Girl in the Grade 1 Kentucky Oaks at 1 1/8 miles. Patrick Husbands, who rode Wonder Gadot in her first four starts, regains the mount. Casse and Husbands have teamed up for Woodbine Oaks wins with Lexie Lou (2014), Sealy Hill (2007) and Kimchi (2006). Barber owned Lexi Lou. Capable of giving Wonder Gadot a run for the money is Dixie Moon, whose credentials include a last-out second-place finish under regular rider Eurico Rosa da Silva in the Grade 3, 1 1/16 mile Selene Stakes here on May 19. “She showed a new element there, by relaxing off the pace,” said Catherine Day Phillips, who conditions the homebred Dixie Moon for Sean and Dorothy Fitzhenry. Dixie Moon was a Sovereign Award finalist after defeating Canadian-bred males in the 1 1/16 mile Cup and Saucer on the grass and Ontario-bred females in the 1 1/16 mile Ontario Lassie over the Tapeta. The Curlin filly also contested two Grade 1 one-mile stakes on the turf, running second here in the Natalma (with Wonder Gadot a head back) and a decent sixth in the Breeders' Cup Juvenile Fillies Turf at Del Mar. After training at Florida's Palm Meadows over the winter, Dixie Moon returned to action at Keeneland on April 8 in the one-mile Appalachian but was a non-factor in finishing last of nine over yielding going. Day Phillips and Da Silva won the Woodbine Oaks with Neshama in 2016. Queen's Fate was beaten just a nose as the runner-up to Dixie Moon in the Ontario Lassie when making her local bow and her first start on a synthetic surface. But the filly has failed to build on that effort in three tries this year for owner/trainer Mike Maker and Maxis Stable, with her most recent a faltering fifth-place finish here in the seven-furlong Fury. Fairy Hill, from the barn of leading trainer Norm McKnight, was claimed for $25,000 here last November and then finished seventh when making her stakes debut in the Ontario Lassie. Owned by Bruno Schickedanz, Fairy Hill is coming into the Woodbine Oaks off a convincing front-running score in an optional $40,000 claiming/allowance event at 1 1/16 miles. Hot Cash, a maiden after four starts, will be looking to follow in the footsteps of last year's Woodbine Oaks winner Holy Helena for owner/breeder Stronach Stable and trainer Jimmy Jerkens. Luis Contreras, who guided Holy Helena to her Woodbine Oaks-Queen's Plate double, picks up the mount. Contreras also engineered an Oaks-Plate parlay with Inglorious in 2011. Hot Cash's sire, Ghostzapper, also is the sire of Holy Helena and this year's Plate Trial favourite, Telekinesis. All starters carry 121 pounds. The Woodbine Oaks is the first leg of the Canadian Triple Tiara, which continues here with the 1 1/16 mile Bison City Stakes on July 1 and concludes with the Wonder Where over 1 1/4 miles of turf on August 12. The Oaks will be aired on TSN GO from 5:15 p.m to 6:15 p.m. ET. The broadcast, hosted by Jason Portuondo, will also include the Plate Trial and a feature on Emma-Jayne Wilson, this year's recipient of the Avelino Gomez Award. 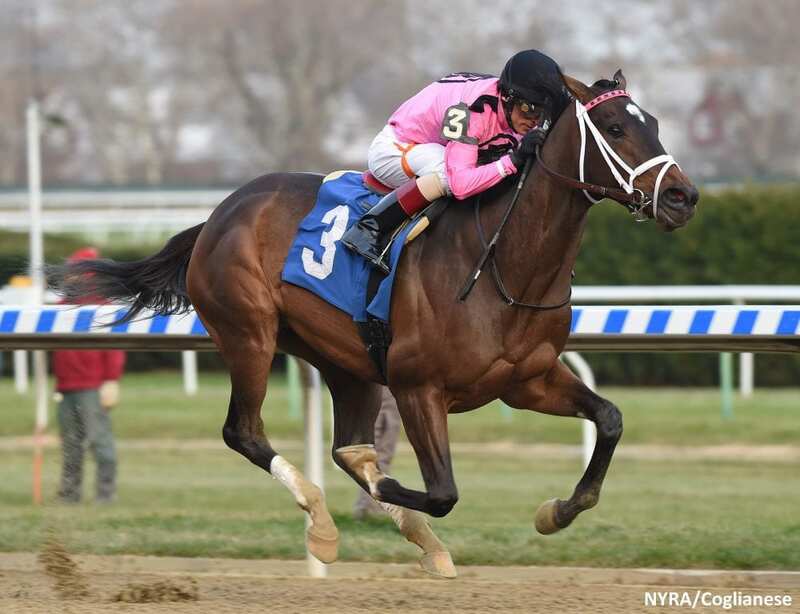 This entry was posted in Racing and tagged canadian triple tiara, catherine day phillips, david anderson, dixie moon, Mark Casse, wonder gadot, Woodbine Oaks by Press Release. Bookmark the permalink.